We have a nice crop of okra in our garden. It is one of the simplest side dishes to prepare for your family or friends. Rinse well and slice pods. Shake bowl tossing okra liberally with flour. Toss a drop of water in the oil to make sure it is sizzling hot. Fry in a couple of inches of oil till golden brown ( about ten minutes). Let okra cool slightly on newspaper before serving. And the Spirit of Christ fill you. Yummmmmm! I love okra, which is decidedly un-Northern of me, but I do so love it. I saw some at the farmer’s market but didn’t buy any. I’m going to pick some up next time I’m at the store. And I’ll use the cornmeal idea. It sounds delicious, so delicious, I’m salivating! 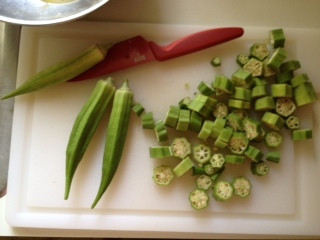 I was just snacking on a little raw okra and it is quite tasty! Thanks for stopping by Ann. We love an occasional okra dish, and this is a must try with the corn meal. We haven’t had luck growing it here, but when we lived in Oklahoma we had a bumper crop and lots of tomatoes. 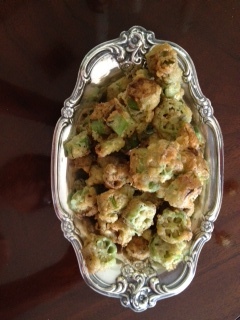 We often made an Okra and Tomato dish. Yummy!